While the pumpkins were cooking down yesterday, I used the last of my pears to make a batch of pear ginger jam. I’d never had this particular combination before, but have heard good things about it, so I thought I’d give it a shot. Not knowing any better, I went out and bought myself a nice plump ginger root, only to discover that all of the recipes out there call for candied ginger, not fresh. Instead of dashing out to buy the candied variety, I opted to experiment with what I had. Since I’ve never tasted the original version, I can’t really compare the two, but what I ended up with tasted absolutely wonderful. Everyone kept sneaking into the kitchen all evening to steal a taste from the partial jar that’s in the fridge. Put the pears into a pot and mash (or take an immersion blender to the jam after it’s cooked a bit, taking care not to splash yourself). Add lemon juice and ginger; bring to a boil. Add pectin. Slowly stir in sugar. Cook until jam sheets off of the back of a spoon. Ladle into sterile jars and process (about 15 minutes for 1/2 pint jars). The jam tastes like a really delicious, ripe pear, but with a hint of gingery warmth. It would be great used in all the regular ways one uses jam, but I’m thinking it might also be nice used as a glaze for fish (mixed with a little tamari, maybe?). My favorite way of eating it so far is straight off the spoon. *Edited to add: I’ve been making it with 5 cups of sugar lately, instead of 7, and it works just as well. The jam looks divine – thanks for sharing the recipe. Katie – You’re welcome! I’ll be trying your pumpkin butter recipe at some point too, I’ve been looking for a good one. I’m so envious of your location. I worked in Waterton for a summer (the Canadian side of Glacier National Park) and it’s been one of my favorite parts of the world ever since! I agree with Katie. The jam is looks wonderful. Very impressive. On a French note, last week I bought the French Farmhouse cookbook. It is a lovely book (Susan Herrmann Loomis) and 2 nights in a row, dinner has been from this book. No fail, delicious French farm fare. I wish your library had it so you could at least view it. Do they do inter-library loans? PS – the Jack O’Lanterns were so cute! Oops —> The jam is looks wonderful. Lu – I knew what you meant! Thanks! You’re killing me with all the talk about that cookbook, I’ll have to see about an inter-library loan. What have you made so far? This sounds delicious and looks devine. I can understand why everyone kept sneaking back into the kitchen. I will have to give it a try. Cheryl, not sure if you all eat meat, but both of my recipes from French Farmhouse had meat in them. Last night I made a Daube which takes a good day or at least part of an overnight. It had beef, carrots, green olives and fennel — MMMM. The previous evening I made an omelette aux lardons et au pommes de terre. (bacon and potato omelette). Oh did I fail to mention the Creme Fraiche as the finishing touch?!!! Today I am taking your hint about the Laurel’s Kitchen oatmeal bread and I have the oatmeal cooking right now. Thanks! Carla – Let me know what you think. Lu – Mmm, those both sound really good. We don’t eat much meat, but I can usually work around that. By the way, I found myself a copy of the French book for $4 on Powells!! Yay! I hope you like the bread as much as I do! What a find, your French Farmhouse book on Powells! I will watch along the way to see what you might make from the book. I think you will enjoy it. In fact, I enjoy Susan’s writing. In the daube recipe, for example, she says that the meal should be boiling “merrily” along. I just love that it should be merry! I was on the fence wether to make what pears I have left into 9LOL) wine or jam. Seeing yours, I have decided I will try your recipe. I may just go out & find more pears. 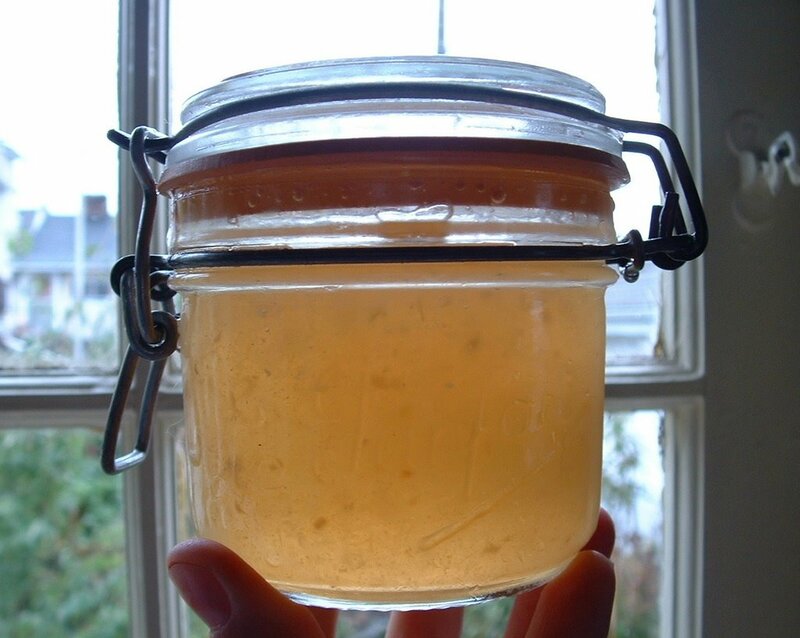 Pear wine or maybe mead sounds so bliss when I think of a lunch with pear jam on muffins and a small glass of pear nectar of the gods/goddess….Thank you for sharing. P.S the tiramisu is afavorite of our family. I will be making your suggested/tried recipe to surprise my father in law for his birthday! Tammie – What a choice to have to make – jam or wine. The jam is lovely, but I’ve never had pear wine, it sounds great. Do you make it like you do the apple wine? I hope your father-in-law likes the tiramisu! One thing I forgot to mention is that I dipped the ladyfingers into the coffee mixture individually rather than drizzling it over them (I wanted them to be uniformly soft). This story sounds familiar! I made a batch of peach-ginger jam last month using fresh ginger (like you, because I didn’t know better) and the results are great. Using candied ginger seems like a bit of a waste of time — after all you’re candying it while you make the jam so why not use all fresh ingredients?! Wow! I just found your recipe via google. Today I gleaned something like 12 pounds of what I believe are Bartlett pears. I’ve never made jam before, and only just learned to can this year. I’m going to try this recipe though. I can’t wait til they ripen up a little more! Thanks for the recipe! I, too, found your recipe via Google because I wanted a recipe that used fresh ginger rather than candied. I have tons of pears also! ps….I’m enjoying your blog and all the recipes. I was just wondering if you peeled the pears or left the skins on for this delicious looking recipe. I found this recipe using a google search for ‘ginger pear jam’ and my friends, it’s fantastic! My proportions are a bit different since I had more pears to use than the 4 cups, but still, it’s delicious!! Amy – I'm so sorry, I just noticed your question (almost a year later!). Just in case anyone else is wondering, I did peel the pears. I just made this! Fabulous, thanks for the recipe. I didn't peel the pears and it just adds to the texture. Wow! I just made this with an adjustment for low sugar. It tastes and looks divine. Didn't want to share the spoon with the hubby. Hey i planted a couple of pears this year this looks awesome will copy and try on next years harvest. Does the type of pear matter? I have a Kieffer and an Ayers pear trees This spring I'll be grafting a heirloom pear I found growing in a field close by don't lknow exactly the cultivar but I think its a Warren. So wish me luck. thanks for the recipe its really great a neibor gave me a box of pears last week been procwssing them I made the pear ginger jam and found that it would make a great glaze on chicken,pork,fish and have tried it on Pork chops its great. Using it as a glaze is a great idea, thanks for the suggestion!